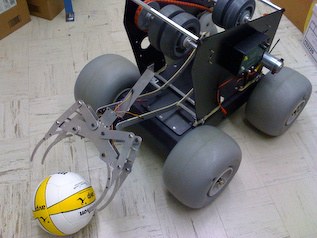 This prototype robot is intended to assist in beach volleyball training by chasing down balls and bringing them back to the players. The robot is also equipped to set the ball accurately at various height for spiking drills. Using OpenCV and an iSight camera, this robot can identify a volleyball based on its color, size and roundness. The gripper on the back is able to pick up the balls and either carry them to a GPS location or place them into the ball-shooter. This robot has an on-board computer for autonomous navigation, or can be remote controlled wirelessly with a spread-spectrum serial transmitter or tethered using a standard Play Station controller. COMPUTER: Apple MacMini, 2.66GHz Intel Core 2 Duo. MOTORS: Dual Johnson 24V with planetary gearhead. GEARBOX: Machine Lab right-angle gears w/ encoders. BATTERIES: BattlePack NiMH 4200mAHr 24V. TETHERED: Custom Play Station-to-CAN interface. NETWORK: CAN protocol w/ custom CAN-Serial adaptor. SENSORS: Sharp IR array, GPS, compass, iSight camera. COMPUTER VISION: OpenCV based histogram filtering. This robot is based on an MMP-40 platform, designed and built by The Machine Lab, Fort Collins, CO. The Machine Lab (TML) specializes in customized robotic platforms for research and military applications. For the purpose of demonstration, the robot is under remote control during the filming of this video. When autonomous, this robot will use an iSight camera and OpenCV running on a Mac Mini to identify and track the ball based on color and roundness. It has an on-board GPS and compass for navigation, and will have a memory-map of the court and where it is most likely to find more balls based on its previous experience.